In a small pot cook the farfelle water with the 2 cups of water. Add chicken bouillon and boil until water has reduced. 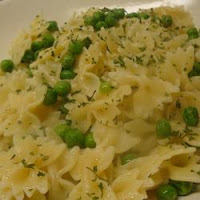 Stir in butter and peas. Add red pepper flakes if desired. Serve with sprinkled parsley on top.